Anyone know where the main gantry will be? Are we going to end up with empty corporate seats on show as they have at Wembley? I always think that looks awful on TV. I suspect it will be wherever it was for the Olympics, along whichever side was the finishing straight. As JBB says it will no doubt be the same place as the Olympics, Rugby etc. So they will face the big East Stand. 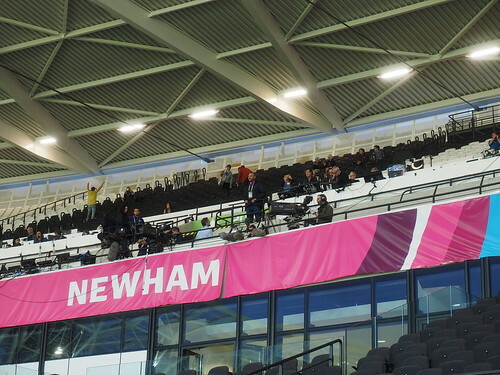 As much as I loved the East Stand/ Chicken run at the Boleyn, having the cameras in the West Stand made the stadium look smaller than it was. It would have been better if they faced the West Stand like they did in the older days. Ah yes, that makes sense. The finishing straight was on the west side wasn't it. Front of the West Upper. Click on image to enlarge. bengeo wrote: Front of the West Upper. Click on image to enlarge. Thanks BB. The TV cameras will show that view, but from a bit higher up. It'll look good with the East Stand in the background. That photo was taken at a very wide angle setting, so it makes the pitch look a lot further away than it is in reality. The Romania fan at the bottom of the shot is loving it! I think those Flickr pictures look amazing. bengeo wrote: Thanks BB. The TV cameras will show that view, but from a bit higher up. It'll look good with the East Stand in the background. That photo was taken at a very wide angle setting, so it makes the pitch look a lot further away than it is in reality. There will also be at couple of camera positions in the a East stand. You can see the space made for them in front of the entrance to block 236.